When you’re faced with a doorway, you can choose to stand back in fear, or be bold and choose to walk through. This substantial sterling silver pendant serves as a weighty reminder to grab the power of your genius and see what magic happens when you step through a door to follow your dreams. We engrave the word “boldness” above the door crafted into the sterling silver rectangle. Then, using a special proprietary process, we engrave Goethe’s inspirational quote in lovely handwritten script. 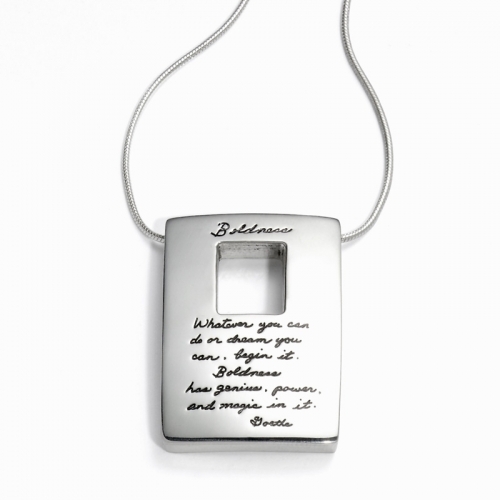 The pendant rests on an elegant 18” sterling silver chain. We hand polish every piece to make sure the jewelry shines as brightly as your dreams.